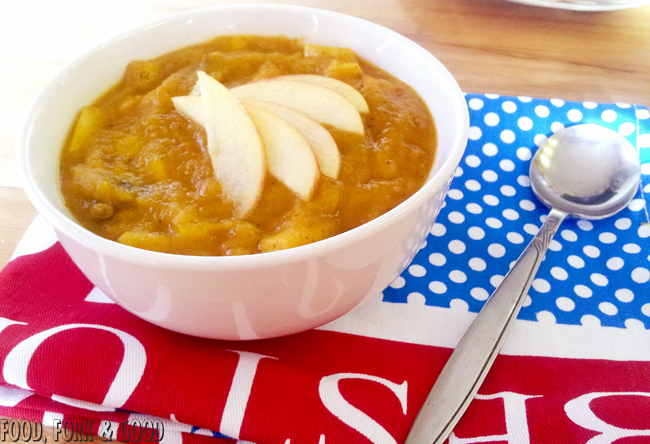 Pork & Stewed Apple Chunky Soup - Fork and Good. Let's get one thing out of the way. I love soup! Whilst I've been off sick, I literally had it everyday. I'm not one to let a little thing like not being able to smell affect the quality of what I'm eating either. Of course, I had a nice big selection of root vegetables, tomatoes, spices, legumes, herbs & fruits. Let the soup making commence! Now, as usual there were some disasters. 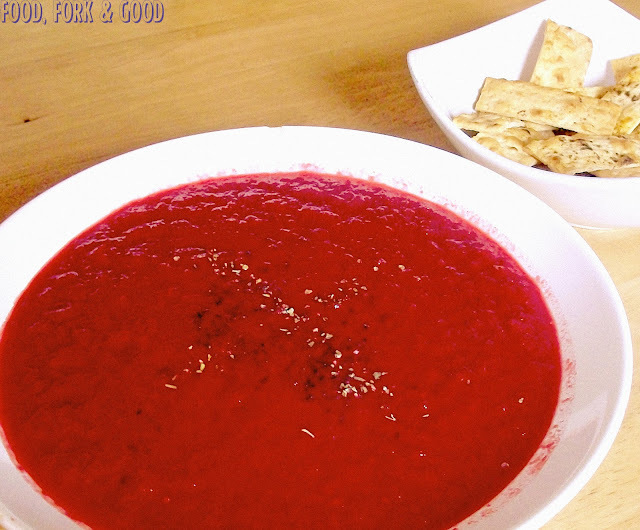 Whilst beetroot soup looks very pretty and dyes your lips vibrant purple, if you get the consistency of beets wrong, you're in for a soup that tastes like mud, even through a snotty nose. Looks amazing, tastes like bog. On the other end of the scale, is the chunky soup. Let's be fair, they usually look like sick, but they are my favourite type of soup. I can still remember being younger, sat at a table, kicking my legs, and slurping at a bowl of minestrone, with a big crusty roll for dipping. I would fish around for the best bits, like the piece of chicken, or the big crunchy water chestnut. It's the savoury equivalent of searching for the marshmallow bits in your cereal. So a week of soup, what was my best creation? This one. Duh, I wouldn't name my post after the second best! Okay, I'm a messy eater. I'm a 'tuck a napkin down the front of shirt' kinda girl when it comes to anything food related. My mum kindly asks how I can miss my mouth, and I reply "I enjoy my food". I'm regularly asked "What the hell is down your front?" by curious friends & family. So when it comes to soup, I need a big roll of kitchen towel next to me. Hope you enjoy this chunky, messy and hearty soup as much as I did. (It went everywhere). 1 1/2 pints boiling water. 1 tablespoon sifted gram flour. 2 small gala apples, chopped into small chunks. This part is pretty simple: Chop up all your veg, garlic & fresh herbs, pop them in a large saucepan, cook on low for a few minutes. In a jug, prepare, dissolve your stock cube into the boiling water and add the dried oregano, cumin, honey & vinegar. Mix, then pour into the saucepan. Cover & leave to gently simmer on medium heat for 20-30 minutes. In another pan, add your chopped cooking apple, cover with 8 tablespoons boiling water & 1 teaspoon sage. Leave to stew on low heat for 20 minutes. Check often. Once all the vegetables are soft in your saucepan, add the stewed apple (in the water it was cooked in) and gram flour. Give it a good mix and cook for a further 5 minutes. Then blend until fine and smooth with no lumps. In another pan, fry up your sausage in the olive oil. Once it starts to brown, add in the chopped gala apples and stir until it's all cooked. This takes about 5-7 minutes. Then add in the blended vegetables and simmer on low for 5-10 minutes, stirring constantly. Then ladle into bowls and serve. This soup keeps in the fridge for 3 days. 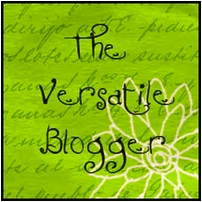 In other news, I was nominated by the very talented Ellie over at The Boo, The Bear and the goji berries for the versatile blogger award, I am so grateful for the nomination! I don't think you write out the same thing again, so I guess my previous nominations stand as one! Right, I'm off to my brother's end of year art show, dinner & then a movie with my Mum & Auntie. Yay for 2 days until the weekend! I have to admit I've never heard of adding apples into a soup. I'm intrigued. I am a big soup fan also. Fishing around in your soup to find the good bits sounds familiar. I still do that! 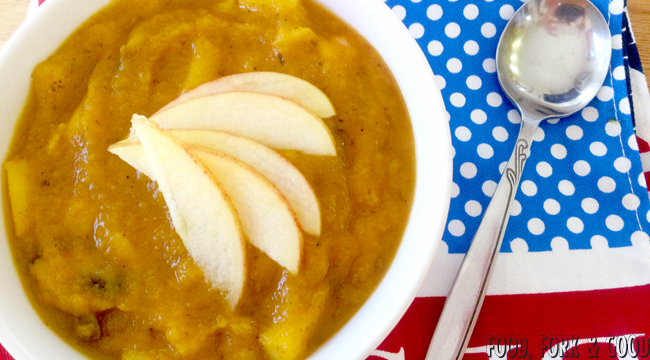 This soup sounds intriguing with its hits of sweet and savory! So when it comes to broth, I need a big throw of cooking area hand soft small towel next to me. Wish you appreciate this big, unpleasant and good amount of broth as much as I did.